Old Shale is a great way to introduce yourself to lace knitting. It’s a simple four row repeat with a single pattern row. It’s easy to memorize and the result is spectacular. 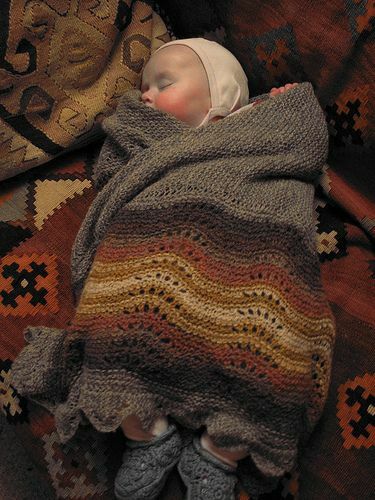 Old Shale is a common stitch used in the Shetland Islands for knitting a border on a hap shawl. The borders sometimes use multiple colours which emphasize the waves in the knitting. Round 1-2: Knit all sts. These 4 rounds complete the pattern. This video that demonstrates Old Shale stitch used for the Old Shale Tee. I’ll knit Old Shale any time!